I used to love roller coasters. The thrill of the ups and downs, the screaming, the adrenaline rush. 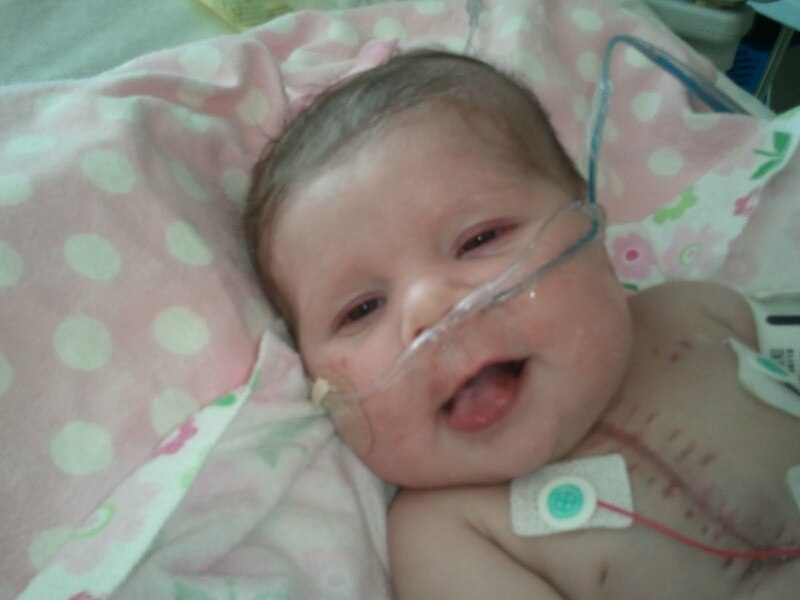 I updated the other day that Annabelle was off the ventilator and on CPAP and was SO SO excited. 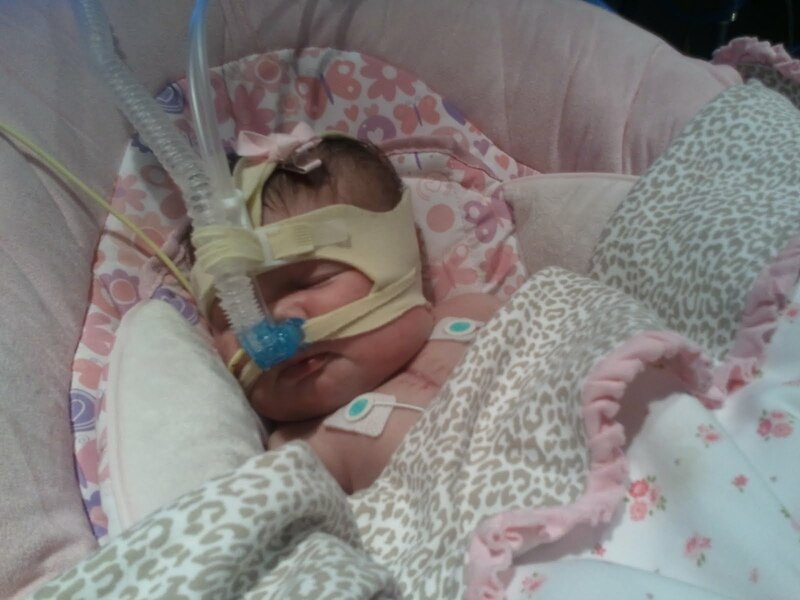 They took her off CPAP in the middle of the night on Monday, and Tuesday morning put her on a less invasive machine called Vapotherm that still puts positive pressure into her nose but isn’t as annoying as the whole head-gear thing. I was excited, but Annabelle was even MORE excited… because she gave me her FIRST smile that morning! I screamed, cried, showed the nurse, took pictures, and called every person in my family to squeel this good news to. It was a huge high for me, a much needed one. We had plans to have my cousin-in-law and sister-in-law come and take GOOD pictures of her that night since she was happy and off her machine (better than my puny camera…) and everyone wanted to come see this smiling, mask free baby! My heart overflowed. I went to work (a little late… had to spend time with my baby!) and got a call a few hours later that she’d turned blue, her numbers weren’t good, and back on the CPAP she went. And there plummeted my day. I then got another call not long after that my grandfather wasn’t expected to last more than 24 to 48 hours. This is just a small snapshot of what the last 2 months have felt like. I’d get GREAT news…. only to be followed with very frustrating news. Granted, she’s not reintubated (although they were thinking about it last night) but it was just discouraging. I do know this though, about this crazy roller coaster. God is with us in the good AND the bad. Sometimes I think he sends things like smiles to help us be able to survive the things like desatting and putting masks back on. He gives me e-mails from people, sometimes ones I don’t even know, that encourage me with their prayers at the time I need it most. Little things like “praying for you” phone calls/talks/facebook wall writes/blog comments/e-mails go a LONG way for me these days. It’s a reminder that even when I feel so very lonely and discouraged, that someone thought about my Annabelle and prayed for her, and it helps lift me up and gives me just enough juice to carry on. So just wanting to thank you all. Everyone asks how they can help, but just caring enough to pray or reach out is a big thing. Someday (soon… beware!) I’ll start accepting some of the offers from those here for meals/babysitting and things, but for right now, just know your thoughts and prayers are oh-so-needed and appreciated. Not sure when we’ll try vapotherm again. We wanted to give it at least today, so tomorrow will be the earliest. So far, she’s doing good again and her blood gasses are GREAT! Please pray that the doctors have wisdom on when she is ready, and that when they switch her, that she does GREAT and does NOT look like a smurf this time! Still has valve leakage so we still sit in the ICU until her next surgery. I *think* they might start testing her to see if she’s ready in about a month or so. The next surgery should (WILL DAD GUM IT!!!!!) help with the leakage. So, those are the requests/updates of the day! As I was finishing this, got a call from my Mom. Grandpa is with Jesus now. I’m so sad not to be at my Mom’s with the rest of my family right now, but Annabelle needed me tonight and I think grandpa would have understood. Just.. yeah. Prayers for my family are appreciated too. He was 94, and loved Jesus SO SO SO much, so I know He’s in a better place. I just miss him already. Below is a picture I posted before, but am doing again in honor of my grandpa. He visited us just a couple of weeks ago right before Annabelle went back on the vent. I’m so so so glad we had him come up when we did. I’m 100% sure it was God’s prompting as He knew the time was close. Blessings to all of you. Lots of hugs and prayers coming from this direction. Ah, Krista–such a roller coaster indeed. You are a Rock-solid blessing. Hugs and so many prayers to you, your precious Annabelle and entire family. God bless you–He is so good, always. May GOD bless Annabelle and each of you far beyond what you could ask or imagine. God is doing such amazing things to you and through you. Your testimony in these posts shines like a beacon. 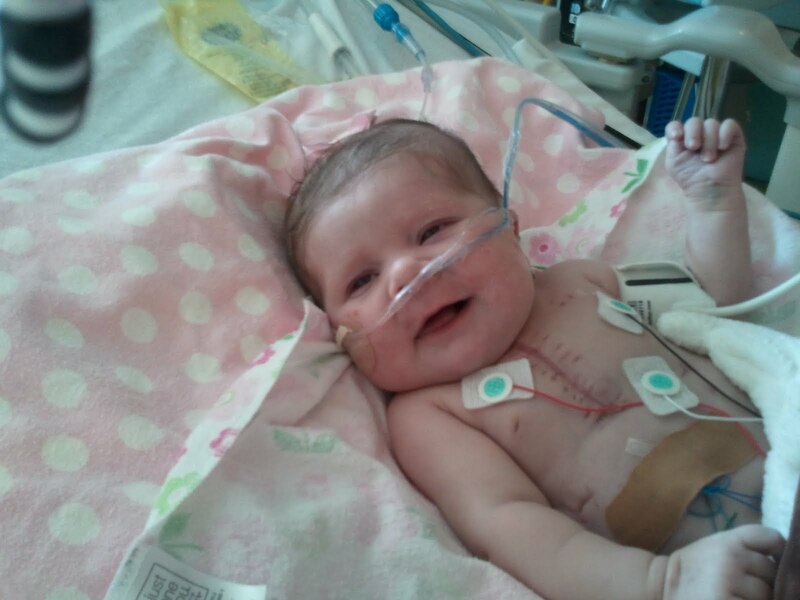 That smile from Annabelle…what a treasure…it's mega-watt happy! My heart just goes out to you Krista. What a precious adorable smile that little Annabelle has!! Praying God gets you and your family through this time so you can bring her home and see many many many more smiles to come. Thank you for the update. Sorry about the loss of your grandpa – what a great man of God! Sounds like he left quite a legacy. What a profound article you've written. I pray it will find a home someday in a publication that will ease the pain that others feel who have a fragile precious baby. Annabelle looks SO FABULOUS!! Those are SMILES!!!! What a great pic of her smiling!! Sending you lots of well wishes!!! I'm so sorry about all the ups and downs with Annabelle. I'm praying for her and you and your family. Know that you all are never far from my thoughts and prayers. What a roller coaster indeed! You are such a wonderfully courageous woman, Krista. I know that God is blessing and inspriing many people through your struggles. Annabelle's smile is so precious. *biggest hugs* I'm sorry to hear about your grandfather, but excited that He's gone home. God bless! Krista – sorry to hear things are still so tough. 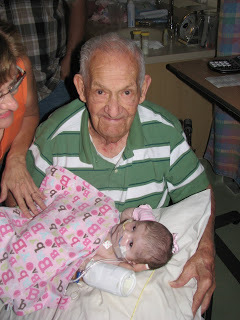 That's neat that your grandpa was able to meet his great-granddaughter before he passed on. That will be a very special picture for Annabelle someday. (My mom's dad passed away when I was only about a year and a half, so all I have of him is a similar picture.) You're in my prayers! Hi Krista, I saw your post on Bowen's blog and just read about Annabelle. I have a two-year old daughter with HLHS, so I understand some of what you're going through. I am sorry about all the ups and downs, and especially about your Grandpa. It's sweet that he got to meet Annabelle. I just wanted to say "hi" and let you know I am praying for your daughter and your family. How wonderful you have a picture of your granddad with Annabelle! I know you'll always treasure it. I have stumbled upon your story from "bowensheart.com". I can completely relate to the analogy of a roller coaster ride when you have a "heart baby", our story is at http://www.carepages.com/carepages/MadisonsWorld . Like the man made ride, you are captivated and restrained unable to get off, while the car leaves the implied safety of standing still. There are moments of anticipation, elation, terror and exhaustion as the car follows the track. I feel God runs our ride in a similar manner, just as we have faith that the man-made car will never leave the track we sometimes forget the need to have the same Faith that God would never let us leave the track he has built and provided. I am Grateful to see the positive spirit you have during your very difficult journey and I Pray for God to slow your "car" and let you experience His Love and Grace at a quieter pace. My sympathy to you concerning Grandpa. Thanks everyone for your prayers!!! And Jenn and Matt, thanks for visiting and for your prayers! I know you can relate to the roller coaster, and know that I'm adding your little ones to my prayer list as well!! Still praying for you and Annabelle. I'm so sorry about your grandpa. But praise God he is with Jesus now and that he was able to see Annabelle before he died!